Dear EarthTalk: Why do environmentalists advocate that people “eat locally?” I don’t understand the connection between patronizing local food producers and environmental quality. John Ikerd, a retired agricultural economics professor who writes about the growing “eat local” movement, says that farmers who sell direct to local consumers need not give priority to packing, shipping and shelf life issues and can instead “select, grow and harvest crops to ensure peak qualities of freshness, nutrition and taste.” Eating local also means eating seasonally, he adds, a practice much in tune with Mother Nature. Portland, Oregon’s EcoTrust has launched a campaign, the Eat Local Challenge, to encourage people to eat locally for a week so they can see---and taste--the benefits. 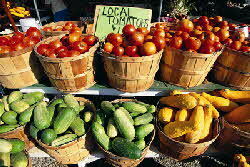 The organization provides an “Eat Local Scorecard” to those willing to try. Participants must commit to spending 10 percent of their grocery budget on local foods grown within a 100-mile radius of home. In addition they are asked to try one new fruit or vegetable each day, and to freeze or otherwise preserve some food to enjoy later in the year. GOT AN ENVIRONMENTAL QUESTION? Send it to: EarthTalk, c/o E/The Environmental Magazine, P.O. Box 5098, Westport, CT 06881 USA; submit it at: www.emagazine.com/earthtalk/thisweek/; or e-mail: [email protected] .